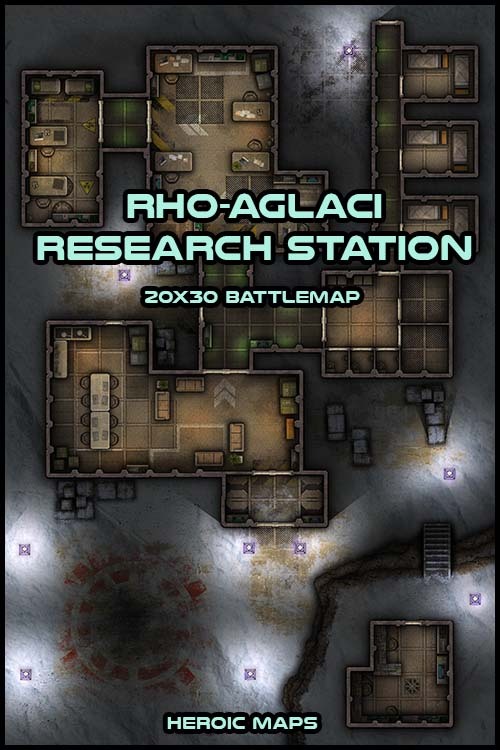 There are few that call the barren ice-world of Rho-Aglaci home, but the scientists that live and work at the Rho-Aglaci Research Station certainly do. Isolated from the nearest military outpost by over 700km, the facility is self-contained and self-sufficient, and the isolation gives the team plenty of time to focus on their work. However, when they find something trapped in the ice, the extreme isolation perhaps isn't the best situation to be in. A printable battlemap compatible with any RPG/skirmish game. Use as a standalone gameboard, or combine with any same-scale tileset. Contents: A 20 x 30 sci-fi map depicting an a research station on a frozen ice planet. Night has fallen, the exterior lights are on, and the research station is alone. Living quarters, locker rooms, bedrooms, workrooms and laboratories make up the main facility, although there is also a landing platform outside and a transmitter room reached by a stretch of steps that lead up a frozen cliff.